In the latest Teen Science Café in Whiteville, NC, our leaders and guests, with the help of the guest speaker, dove into what it means to be a citizen scientist for the science community. Emilee Winters from the Bald Head Island Conservancy’s team shared the impact that a citizen scientist can have on research from around the world. So, grab your phones and get ready to use your blogging and social media skills to aid countless scientists around the world. The Teen Science Café opened with the speaker covering the basics behind community science: everyday people, like yourself, get to contribute to research as easily as one press of a button. With the iNaturalist app, all it takes in the snap of a photo of a plant, animal, or insect to add to the increasing knowledge that has accumulated from average people using the app. After a picture is taken, the iNaturalist app automatically compares it to the information within its database, along with other people, to locate an identification match. Afterwards, this information is available to see what you’ve documented and where it is. Ultimately, this information can be used to rediscover organisms that have thought to be extinct, track migratory patterns, uncover new species, and several other diverse ways. New species have been discovered with the use of this app and the help of multiple people who have graciously donated their time. 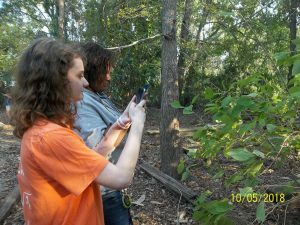 Once every teen downloaded the app onto their phones, we headed outside to test out the iNaturalist app and document the plants and animals around our museum. 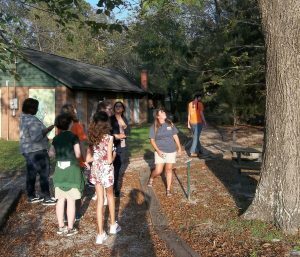 Our teens documented everything from organisms as large as trees to organisms as small as termites and as weird as a slime mold called chocolate tube slime. A couple of our teens received a response from a licensed scientist just a couple of hours after posting it on the app. 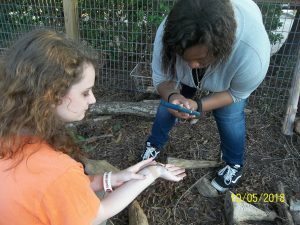 With our teens educated and experienced on citizen science, they headed out excited about documenting the creatures around them. 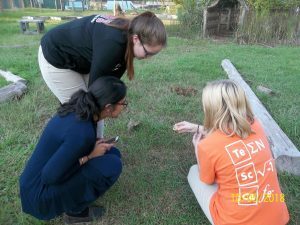 Thanks to Emilee Winters, the environment appeared to be bursting with life that contained creatures great and small, but most importantly, she showed how simple it was to contribute to the increasing knowledge about the natural world around us.